This one goes out to all my girls (and guys) who have ever walked away from someone they loved. Let me preface this by saying that I don’t always follow my own advice. As we get older, it seems we are ruled by alarm clocks, bell schedules and plans. Why do we submit to them? The Donald Claflin Jewelry Studio was founded in 1966 and is a very unique workshop among colleges and universities. Jeff Georgantes, director of the studio of 14 years, says that to his knowledge, no other academic institution has a professionally-managed jewelry studio open to all students, regardless of major. I first heard about Comparative Literature 42.01, “Prada, Chanel, Ferrari: History and Literature” during the tail end of this past fall term. Long enough into the term that I’d begun to feel that itch: the one that you feel when you have just finished midterms and major projects, but have yet to begin finals. Dartmouth people are intimidating. First-day-of-class icebreakers often lead to awkward situations, like when you provide the fun fact that you have a dog named Milo and the person across from you responds with her discovery of a dwarf planet. Rauner Special Collection Library is, in a way, its own hidden gem. It’s not one of the more popular study spaces on campus, because of its limited space and hours, but it houses a plethora of rare and valuable artifacts most Dartmouth students, myself included, know nothing about. As college students, we face a constant pressure to always be happy. These are supposedly “the best four years of our lives,” and we all know that time at Dartmouth goes by quickly. My mother always said that you need darkness in order to fully appreciate light. At 10, 13, 15, even at 18, I did not like this analogy. Resting B— Face. Resting ... Bad-at-being-happy Face. At least, that’s what I think it stands for. I don’t really understand it. Milestones. Sometimes, milestones are a good thing — who can forget the joy of their first day of starting college, of a baby’s first “mama,” of buying one’s first apartment? However, occasionally, milestones can signal something less than desirable — the 25th day of a government shutdown, the first day that you don’t oversleep your 9L, your first real heartbreak. 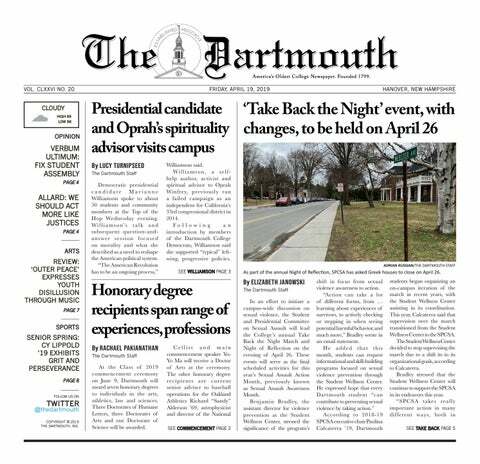 In celebration of Dartmouth’s 250th anniversary, this week’s issue of the Mirror is all about milestones.